Many of the floor plans that will be available at Fountaingate Gardens—a Life Plan Community (also known as a Continuing Care Retirement Community, or CCRC) that will be built in Commack—will feature large windows to allow the natural light to stream in. The Iris floor plan, however, takes it to a new level. As a corner residence in The Terraces, these apartment homes feature 12 windows, with an impressive eight located in the main living area, allowing for an abundance of beautiful, natural light. A signature of all residences in The Terraces is window placement on two different walls, allowing the light to filter in for more hours of the day. The Iris has a layout that is great for entertainers who like to keep their bedrooms private, or for couples with opposing schedules. With the living area separated from the master bedroom, guest bedroom and bath, it’s likely that the night owl won’t disturb the early bird. The modern kitchen offers beautiful all-wood cabinets with plenty of storage, full size, high-quality appliances and a large breakfast bar. The open-concept design keeps the chef engaged with the rest of the party during gatherings, or in perfect view of the TV when creating snacks during the big game. The dining area features three windows, allowing you to dine while awash in natural light. The living area, which has plenty of room for your living room set-including your couch, love seat, chair, coffee table, and entertainment stand-features five windows on two walls. Off the living area is a spacious terrace, which has enough room for a small bistro table, chairs and potted plants. In addition to two full bathrooms, the Iris offers plenty of closet space including a hall closet, linen and walk-in closets in the master suite, and a large closet in the second bedroom. If you don’t need to use the second room as a bedroom, it easily converts into a hobby room, office or den. Whatever your needs, the Iris’s rooms can accommodate! The master suite is truly spacious, featuring enough room for a king-size bedroom set. The closets have ample storage for all of your clothes, jackets and soft goods–there’s plenty of room! The master bathroom features a walk-in shower and a handy linen closet, keeping your towels and linens organized and conveniently located. 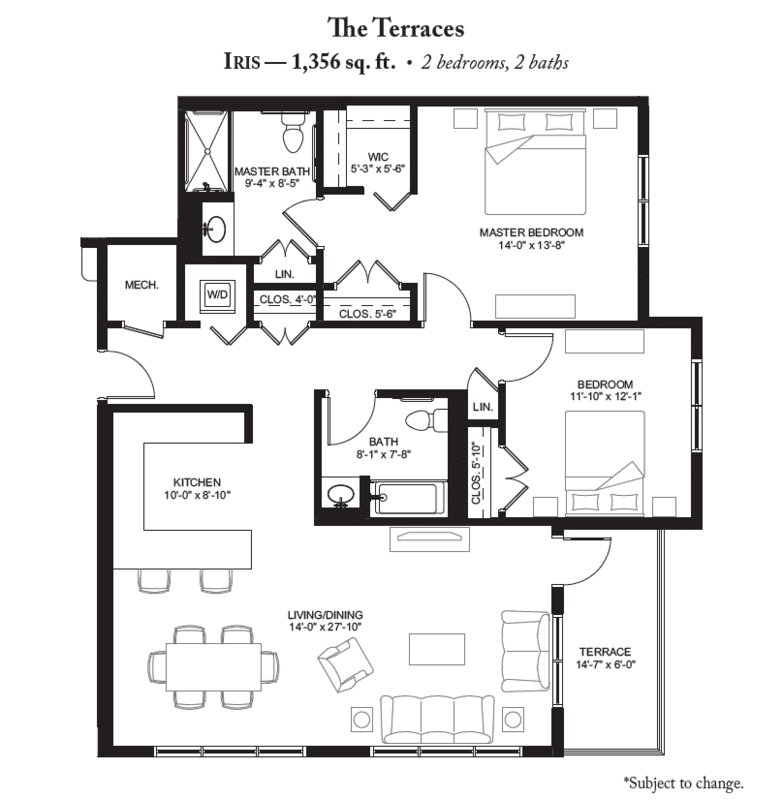 The Iris is a beautiful apartment home option at Fountaingate Gardens. To learn more about how you can reserve your residence, and why you should reserve it now, call our sales team at (631) 715-2693.